China To Boost Defense Spending Amid Regional Tensions : The Two-Way Beijing has proposed increasing its military outlays by 12.2 percent due in part to what one official called "severe security challenges." Delegates from China's People's Liberation Army (PLA) march from Tiananmen Square to the Great Hall of the People to attend sessions of National People's Congress and Chinese People's Political Consultative Conference Tuesday in Beijing. China said Wednesday that it plans to increase defense outlays by more than 12 percent, to nearly $132 billion, this year in the face of what a top military official described as increasingly severe security challenges for Beijing. The proposed 12.2 percent boost exceeds last year's 10.7 percent increase. It comes amid continuing maritime tensions with China's neighbors, including Japan and the Philippines, mostly over disputed islands in the East China and South China seas. The increase comes as Chinese officials said the country targeted economic growth at a steady 7.5 percent. As we reported last month, a senior U.S. military official said he believed that Beijing was preparing for the possibility of a "short, sharp" war with Japan over the Senkaku/Diaoyu Islands, a tiny island chain in the East China Sea. Beijing's announcement follows Tokyo's own plans for increased defense spending and China's unilateral declaration of an Air Identification Zone in the region. "Foreign military analysts say China's actual annual military spending is higher than the official figure. IHS Jane's, a defense industry consulting and analysis company, estimated that China would spend $148 billion this year, but such estimates can vary widely. The unofficial estimate is still much less than the military budget of the United States, which is officially $526.8 billion for fiscal year 2014. "Dennis J. Blasko, a former military attaché at the American Embassy in Beijing and a retired Army officer, said the 2014 Chinese military budget 'won't break the bank, but it says to the troops, "Thank you for your service, you are important to us, we support you.' "
"The buildup of the People's Liberation Army [PLA], which also includes navy and air force branches, is considered by many analysts to be consistent with the size of China's economy — the second largest in the world — and its global political influence. Nevertheless, the military expansion is being closely watched by other nations in the region and by the United States, the supreme military power in the Pacific." 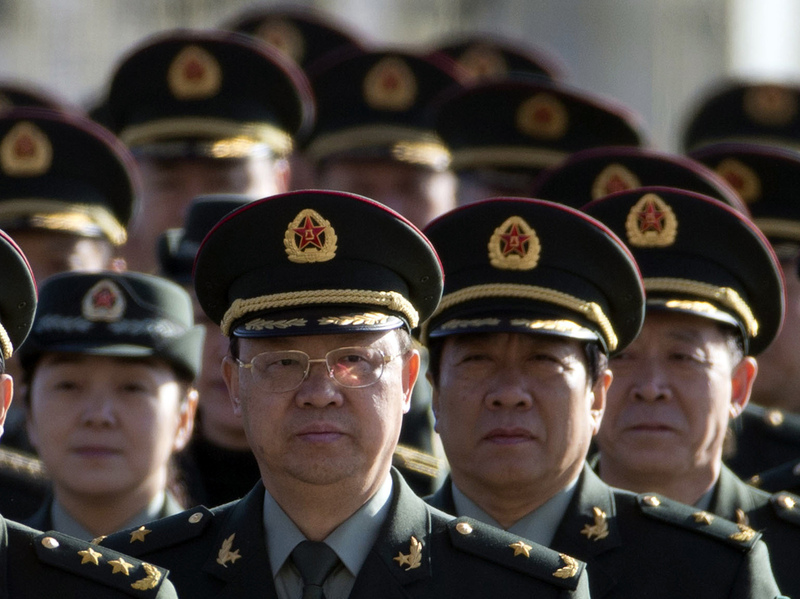 A spokesman for China's Foreign Ministry said the modernization of Beijing's forces is "nothing to get fussy about." "China's PLA aren't like scouts carrying spears," said the spokesman, Qin Gang. State-run Xinhua paraphrases (Rear Admiral) Yin Zhuo, director of the Expert Consultation Committee of the People's Liberation Army (PLA) Navy, as saying that China's military spending "is still far from the level it needs to be as the country faces increasingly severe security challenges." The news agency also quotes Chen Zhou, a researcher with the Academy of Military Sciences and a deputy to the National People's Congress (NPC), saying that China's current defense spending is "reasonable and balanced." "Compared with major powers in the world, China's spending in national defense is considerably low either in terms of its share in the GDP or in per capita terms," Chen says, according to Xinhua. Even with the increase, the U.S. outspends China, Russia and the next 10 countries by rank of military outlays, the BBC reports.